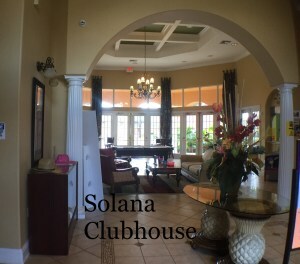 Solana Resort, near Disney World and Orlando, is a well established, exclusive gated community of holiday Mediterranean style homes that features a large clubhouse with all the facilities that you would expect from a top rated vacation resort. When you're back in your primary home, you can rent the home out through Airbnb, VRBO, Expedia, etc. 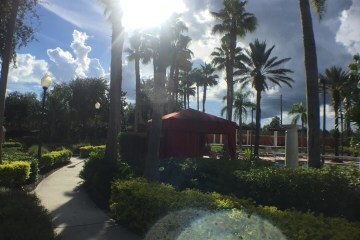 Situated only minutes to Disney World, Universal Studios, and Sea World! Also near are top-notch restaurants and shops, making it the ideal location for your vacation. 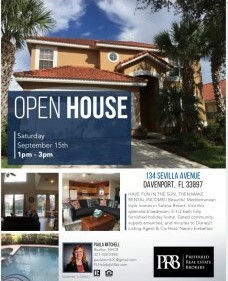 If you happen to be visiting Florida, or even if you live in the area, come view one of the marvelous homes at the OPEN HOUSE on Saturday, September 15th between 1pm-3pm at 134 Sevilla Avenue, Davenport, FL 33897. Take a tour of this lovely 6 bedroom, 5-1/2 bathroom pool home. Built in 2005 it has been meticulously maintained and comes fully furnished, so you can rent it out right away to start making rental income. If you feel a little more energetic there is a beach volleyball court and a recreation field if you wish to kick or throw a ball around or perhaps fly a kite with your children. If you want to do something a little more leisurely but just as fun, then on the other side of the pool is a brand new 18 hole mini-golf course to practice for playing on one of the many top-rated golf courses that are nearby. Alternatively, if you are a bit more adventurous there is the 'climbing ribbon' which is very popular with older children. The tot-lot/playpark is a fantastic addition to the resort facilities for younger kids. Next to the pool is a picnic area with barbeques so you can bring your lunch down to the pool too or have dinner watching the fabulous sunsets that Solana enjoys. Inside the air-conditioned clubhouse, there is a lovely large lounge area with a widescreen television which is perfect for relaxing out of the heat. If you want to burn off some energy there is a fantastic fitness room with all the popular equipment free for Solana guests use - cycling machines, running machines and multi-gym amongst others. There are computers and free wifi for checking your e-mails, keeping in touch with home or work, or making plans for a day out and about at the theme parks or other many other attractions that are nearby. The clubhouse also offers free wireless internet access if you wish to use your own laptop/iPad either inside or out by the pool. For those that like arcade games there is a games room that has both popular modern arcade games along with a more traditional hockey game and pinball machines. There is a concierge service with helpful advice to help you plan your days out at Walt Disney World, Seaworld, Universal Studios and the other theme parks. The friendly staff can also offer advice on nearby restaurants, shopping, golf courses or any other information that you may need to know. They are dedicated to helping guests with their vacation or conference needs. There is also the addition of a small shop that sells the essential items and some souvenirs you may wish to purchase. One of the great advantages of Solana Resort is the safety and security it offers, especially if you have children with you. As it is a gated community there is no through traffic and the facilities are exclusively for the use of villa owners and their guests. This allows your kids to mix with other kids by the resort pool, games room or play areas while you have peace of mind. We all remember meeting new friends on summer vacations as kids and this is a good opportunity for them to do the same. This is one of the many advantages of renting a villa in a dedicated resort community. So why not buy a Solana Villa and get all the benefits from Solana Resort you would expect from a first class resort or vacation hotel, with all the luxuries and individuality of a Solana home? I am confident that you will find Solana Resort the perfect community for your holiday villa and look forward to welcoming you there soon. If you're not available to attend the open house, or if you read this after the open house, feel free to contact me to take a personal tour of this resort and homes for sale. 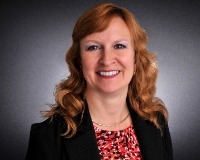 Paula Mitchell, Realtor NHCB with Preferred Real Estate Brokers...call. text or WhatsApp 321-328-5988.